While I was on holiday in Orkney I stayed in one of those old-school, cosy hotels that puts the books guests leave behind on a shelf in the corridor for other people to read. 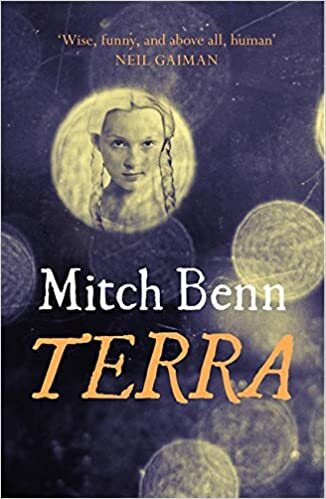 Despite always travelling with my Kindle and buying several books from independent bookshops in Kirkwall and Stromness while I was away, I still can't resist browsing these shelves and this time I picked up a copy of Mitch Benn's Terra to read during my stay. If you're familiar with Mitch Benn's work as a comedian and musician you'll probably know that he's a science-fiction fan, and this book falls into the comic sci-fi genre. It's is the story of a baby girl, Terra, who is taken from Earth to the distant planet Fnnr and brought up by Lbbp, her alien foster-father. Except, of course, on Fnrr it's Terra who's the alien, and while she has no recollection of living anywhere else, she's always acutely aware of being different. As the only human on Fnrr, she's physically unlike her friends - she has ears, hair and vocal chords capable of producing vowel sounds, for a start - but are there other, less obvious differences in the way she thinks and feels? And are her fellow humans back on Earth really so destructive and primitive in comparison to the gentle, technologically advanced Fnrrns? Inevitably, people have compared Terra to the work of Douglas Adams and Terry Pratchett, but while I agree it has echoes of both, Benn has found his own voice as a novelist. There's a satirical thread running through the book, but it has a gentle warmth to it too. Benn's prose style has a simple clarity to it, even when the ideas and themes being discussed are large and complex, and the book overall has a charming, fable-like quality to it that I enjoyed. Terra is funny and entertaining, but there are many serious and often touching moments too and the main characters are well-drawn - the supporting characters are perhaps less three-dimensional, but this works well for the purposes of the story and its style and helps us to focus on the main players. From what I can gather, Terra was marketed as a book for adults, but its style, themes and child protagonist would make it equally suitable for kids of, say, ten and upwards. There is a sequel, Terra's World, which I shall look out for.